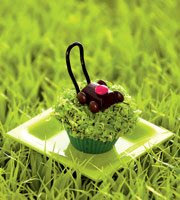 These sweet lawn mower cupcakes are a cut-above choice for Father's Day. 2. The mower is made with a dark chocolate Hershey's Nuggets body, brown M&M's wheels, and a red M&M's engine, held in place with dabs of frosting. Enjoy! I enjoy your blog! Those are the cutest! I bet daddy will love them. Ooh ooh, I love Family Fun magazine! I think everyone should get that! The last two parties we've had I have gone to the web site and gotten ideas for cakes. I did the bulldozer cake for my youngest son which turned out great. I did the pirate treasure chest cake for my older son and that was pretty much a disaster (and expensive). But then again, I'm not the most skilled baker, either!